it’s crucial to make the right choices when setting up your DSE cloud infrastructure. But how can you know which instance types will give you the best cost-to-benefit ratio, both now and as your business grows? That’s where benchmarking helps. 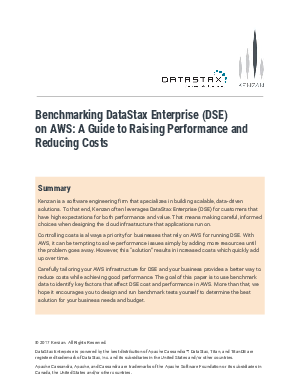 For our paper, we conducted DSE stress tests on an array of hardware configurations, and we simulated various real-world workflows, all to see which EC2 instance types deliver the best performance at the lowest costs.